Okay cool. I may add them later if vibration becomes an issue but ultimately this is getting a built, intercooled L67 with 2 1/2" exhaust through a Thrush Welded series muffler and a Walbro 255 fuel pump. Where vibration noise is concerned I suppose I need to choose my battles. You may wish to put the Torrington bearing on the bottom rather than the top. It will get a lot less exposure to grit and grime closer to the hub than higher up in the wheel well. Iâ€™ve always wondered about the 2gen swap. What donor did you use? Do you keep the oem control arm? Is this swap just to reduce bulk? I wanted to get away from the First Gen Spindle assemblies and into a traditional one. Years ago Miko did a Second Gen subframe and all up front, I bought two new First Gen A-Arms and two new Second Gen A-Arms and had them cut and spliced. They bolt to the First Gen subframe and have Second Gen ball joints. I'm booting the whole thing with those velcro boots after this summer so my plan is to put the bearings at the top like normal to keep water away from them and then inspect / replace next winter.. Summit salesman also thought I was crazy asking if there was a product to help protect the sleeve from the spring, Whoop! DER IT IS! Dumbass, I should call back and try to get a salesman that knows something, I bet the 2 1/8" ID isolators are intended for 2 1/2" coilovers and the dipshit didn't know because him and his Honda Homeboys never deemed it necessary. I didn't know these existed. I've got wear on my sleeves from the springs and would've tried these if I knew about them. AAAARGH! Looking for shock bumpers that don't look like dildos! Edit: whew! found these Energy Suspension 9.6111 at Summit and got 2 pair. I need to get all my suspension stuff out as well for my 94 CS, doing the rear struts first. Those rear strut plates, the factory ones need to be modified so that the bell shaped seat can fit right? Its been too long reading about this and Ive got 80% of the parts. Yeah, they need cut off so the threaded sleeves can go on in their place. If you post a picture of what you've got we can tell you what's missing. I posted this in my GS thread, one rear and one front. I just ordered the other two springs and bumpers last night. I actually disassembled them after this picture so I could put those plastic tubes back on them until I'm ready. 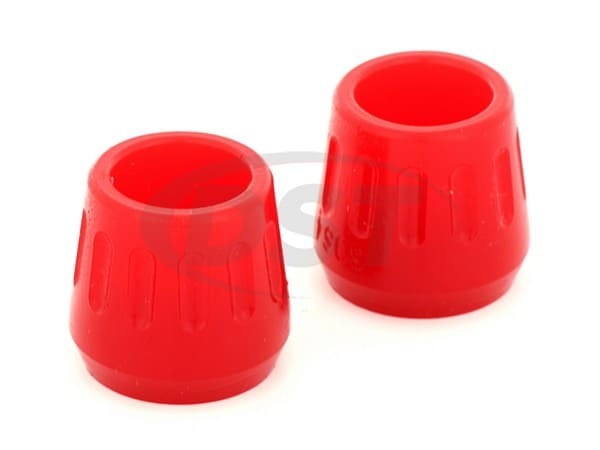 The adjustment things on the ends of the shafts are plastic and don't look durable. One is already a little tweaked just from shipping so the tubes are protecting them. Just a quick update, those bumpers above should fit on any strut, a little wd-40 and a couple whacks with a hunk of pipe and hammer and they're on the shaft. 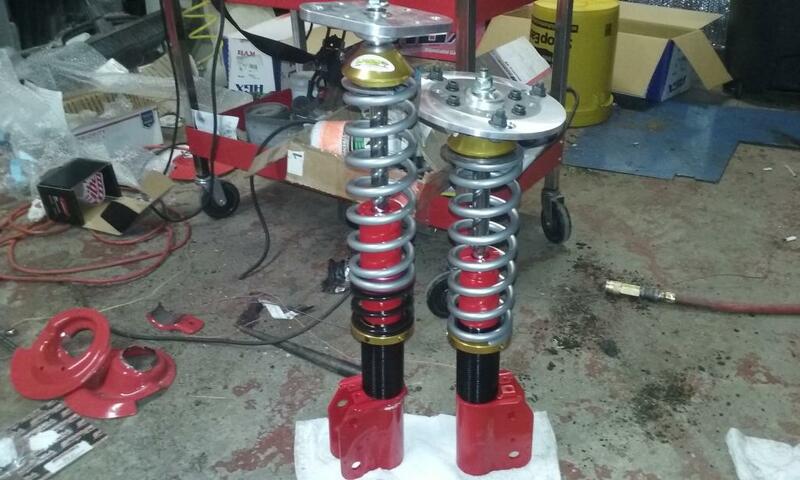 MemphisMan has done a nice write-up on rear coilovers using KYB Excel-G struts and 250# QA1 springs. He's got p/n's, a couple videos, and oodles of pictures on the 7th page of his '91 Cutlass build thread. He did not use tenders though, so this is a traditional rear coilover conversion.